These products promise to help you remove your most stubborn, sparkly, sticky glitter nail polish. But do they work? There’s nothing quite like a sparkling, shimmering, glitter nail polish manicure to lift the spirits – at least until it’s time to remove all those big chunks from your nails. Generally, the most efficient way to remove glitter polish is to wrap your nails in cotton pads soaked in acetone and cover the tips in aluminum foil to really let the remover soak in– but this experience is messy, drippy and nearly impossible to do without a third hand. (Some salons even charge extra for this service. The injustice!) So instead I often find myself cursing over the bathroom sink, glitter and cotton fluff stuck to my fingers, while I feebly attempt to scrape at those last stubborn flecks of glitter. 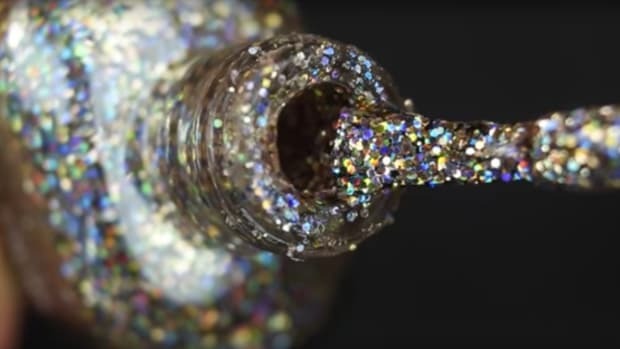 There’s now a light at the end of that glitter-removal tunnel of despair. Nail polish companies are trying to make our lives easier with the introduction of some powerful new polish removers. But do they really work? I layered on Revlon’s glittery Gold Goddess with a Seche Vite base and top coat and put three new products to the test. The product: This remover-soaked sponge is cased in a big tub that allows all five fingers to be inserted at the same time into little slots in the sponge. The company recommends soaking for one minute for cream, matte and pearl polishes and two minutes for glitter. The test: I placed my fingers into the slots in the sponge and left them to soak, using the sponge to gently rub off the glitter. This remover generally does a good job, but I had a few concerns. Since the sponge is soaked in acetone remover, the smell is very strong, plus my nails and skin felt dry after I used it. My nails didn’t come out 100% glitter-free after one soak, and I needed to do a bit of extra rubbing. The glitter eventually came off my nails, but then got stuck to my fingers again, because it has nowhere else to go but the surface of the sponge, causing sticky glitter déjà vu. The product: At first glance, this remover doesn’t seem that different from Cutex’s other drugstore staples. There’s not any sort of gimmicky removal required. It contains 98% acetone, so this is strong stuff, but it also contains Cutex’s patented botanical oils so your nails won’t be completely stripped of moisture. The test: I moistened a cotton pad, firmly pressed, and then swiped it across my nail. One swipe didn’t do much. I really had to work at it the same as I would with most regular nail polish removers. However, the glitter did come off quicker than it does with a standard remover. The verdict: This is the best budget option. It would be great to have stashed away at the back of your cabinet if you’re an occasional glitter user, and it removes normal nail lacquer faster too. The product: This is the most complex of the three products I tried. It includes remover-soaked pads and individual reusable nail caps to closely mimic the cotton ball/aluminum foil technique. (Julep claims it also works well on gel nails, though I can&apos;t vouch for that.) A box includes enough product for five separate uses. You can also just repurchase the pads separately for $10 for 5 sachets. The test: This product was easy and mess-free. I placed the soaked pads (which are also infused with aloe vera to condition the nails) onto my nail then covered with the cap. The pre-soaked pads come in individually wrapped sachets and they aren’t so drenched with product that they drip everywhere. Plus there was no headache-inducing scent. The caps are easy to put on and fit snuggly, ensuring the pad and nail are always in contact. The only hard part was trying to put the cap and pad onto my little fingers – they kept sliding off. I waited three minutes (the instructions recommend 3-5 minutes), then I squeezed and pulled both the cap and pad away. I had nearly clean nails, with only 1-2 flecks of glitter still hanging on, which I easily removed with the already-used pad. The verdict: It’s the most expensive option, but it’s also the easiest and most effective of the three. I also love that, because of the pads, the remover is generally confined to my nails and doesn&apos;t dry out my skin. If you&apos;ve tried out a good glitter removal technique lately, let us know in the comments. Hoping to stock up on nail polish remover at your local CVS to fuel your homemade meth lab? You'll have to shop elsewhere: The drugstore has recently implemented a new protocol barring mass purchasing of the stuff in an effort to thwart the illegal production of methamphetamine. Get opaque glitter coverage in just one coat. For real.